Even the hyenas won't eat the carcasses of Mohamed Aden Guleid's sheep, goats and camels, which litter the landscape in Somalia's northwest Somaliland region. There is too little meat on their bones because of a devastating drought. Herds of animals are dying across Somalia following two failed rainy seasons. 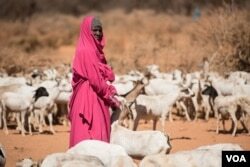 Here in Somaliland, at least 40 percent of goats and sheep have perished, amounting to more than 10 million animals. If April's rains fail again, the people who have depended on these animals for generations may be next. The United Nations warns of famine, and says more than 6 million people need food aid already in all of Somalia. 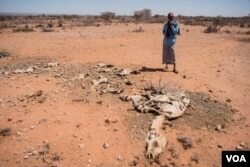 Forty have died so far in Somaliland, according to the National Drought Committee. Those seeking respite from the drought trek for days to towns in hopes of finding food and water. 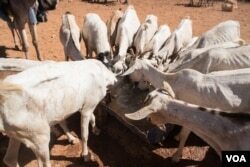 Aid agencies and the government send water trucks to fill dried out wells, and each morning, dozens of herders with hundreds of thirsty animals flock to the wells but the reach of the trucks is limited. Mohamud Ibrahim Yassin says only a few dozen of his 150 animals made the 20-kilometer walk to one well a few hours east of Burao town. He says the rest were too weak to walk, but too skinny to sell. "If we get rains, they will survive, but if there is no rain, I don't think they will survive," he said. Although Yassin has some hope of getting himself through the drought, for others, the rains will be too late. The family of Geelo Ismail Mohamed lost all 100 of their camels over the past seven months, and fled the hinterlands. Now they live on the outskirts of a village in a makeshift hut of wooden poles and scraps of cloth. 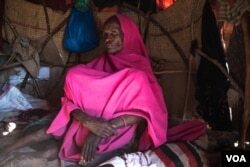 She says they used to support themselves by selling camel milk, but now, they depend entirely on handouts. Adequate April rains or not, aid groups are short on funding, both for immediate drought relief and long-term recovery for families like Mohamed's.The U.N. has appealed for more than $800 million to deal with the drought. Yet Somaliland's own National Drought Committee has raised less than $7 million. “What's coming from the international community, from the donors, even the local fundraisers, the way people are supporting, you find it's just a drop in the ocean. It's not contributing much,” said Mukhtar Mohumed Hassan, of the Save the Children aid group, which delivers water to wells and cash to those who lost all their animals. Mohamed Musse, of Somaliland's National Environment Research and Disaster Preparedness agency, says the rest of the world is moving too slowly. For millions in Somalia, surviving the drought is a race against time.